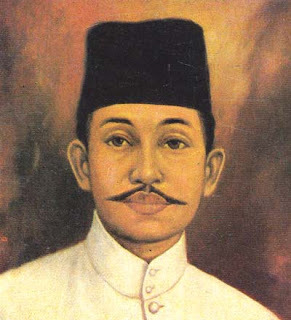 Raden Haji Said Oemar Tjokroaminoto or HOS Cokroaminoto born in Ponorogo, East Java, August 6, 1882 and died in Yogyakarta, December 17, 1934 at the age of 52 years. Tjokroaminoto was the second of 12 children of a father named RM Tjokroamiseno, one government official at the time. His grandfather, R.M. Duke Tjokronegoro, had also served as regent Ponorogo. As one of the pioneers of the national movement, he had several students who later gave color to the history of the struggle of Indonesia, namely Musso socialist / communist, nationalist Sukarno and the religious Kartosuwiryo. But the three students were at odds with each other. In May 1912, joined the organization Tjokroaminoto SI. As the leader of the Islamic Sarikat, known HOS policies are firm yet understated. His ability to trade into a respected teacher knowing with culturally diverse manners. SI movement initially as a form of protest against foreign traders who are members of the Trade SI Islam by HOS regarded as an organization that is too concerned with trade without taking on the political bargaining power. And finally in 1912 turned into SI SID. Along his journey, SI herded into a political party after getting the status of legal entity on 10 September 1912 by the government when it was controlled by the Governor-General Idenburg. SI later developed into a political party with a membership that is not limited to the merchants and the people of Java-Madura alone. SI's success makes it one of the successful pioneers of Islamic parties at the time. SI splits into two camps since the entry of the infiltration of communism forced HOS Cokroaminoto to act more carefully at that. He and his colleagues who still believe in the camps united against the White SI Semaun who had persuaded the youth leaders at the time as Alimin, Tan Malaka, and Darsono in Red SI camp. However, the HOS kewibaan Cokroaminoto it takes as a mediator between the two fractions SI, considering he is still considered by Semaun teacher. Long story short gap between SI and SI White Red widening as it appears the statement Comintern (Communist International Party) against Pan-Islamism (what is always a flow of HOS and his colleagues). This encourages Muhammadiyah Congress in Yogyakarta in March 1921 to urge SI SI to immediately remove the red and Semaun because it was different streams with SI. Finally Semaun and Darsono removed from the SI and then in 1929 promoted as SI Sarikat Indonesian Islamic Party until a participant's first election in 1950. HOS Cokroaminoto until now finally recognized as one of the national heroes pergenakan-based trade, religious and nationalist politics. Pearls Words such as "As high-speed science, pure-pure monotheism, clever-clever ploy" embryonic movement eventually became a national movement leaders were patriotic, and he became one of the leaders who proved the amount of political power and trade in Indonesia. H.O.S. Cokroaminoto died in Yogyakarta on December 17, 1934 at the age of 52 years.